Cathay Receives First Airbus A350-1000. Cathay Pacific has received its first Airbus A350-1000 aircraft at Airbus headquarters in Toulouse, France, making the Hong Kong airline the second in the world to receive the newest Airbus aircraft. The airline follows the launch customer Qatar Airways, which received its first A350-1000 in February of this year. Currently, Airbus has 168 orders for 11 new aircraft from the new aircraft, although it has not yet confirmed which airline will be the third to receive the delivery of the aircraft, which will not happen until 2019. The A350-1000 is a longer variant of its predecessor, the A350-900, of which Cathay Pacific already operates 22, which allows it to have a greater number of seats. Overall, Cathay Pacific's A350-1000 has 334 seats (46 in business, 32 in economy premium and 256 in economy), while the A350-900 has only 280 seats (38 in business, 28 in premium economy and 214 in economy). The executive class and the superior economy present to a large extent the same seat products as those found in the current A350-900, although with some minor adjustments in the mechanisms. The key difference in the business class between -900 and -1000 is that the latter has all the seats in a single cabin instead of being divided into two cabins, as in -900. However, the cabin of the economy class presents a completely new seat product developed by Haeco; these are different from the other new 10-seat economy-class seats that Cathay Pacific recently launched on its Boeing 777-300ER aircraft. The dimensions of the seat are the same as those of the A350-900 - 32-inch pitch and 18-inch width - but have been designed with a different cushion of high comfort and also feature an ergonomically adjustable six-way headrest and a new tray of table offered. Asked why Cathay Pacific chose not to equip the aircraft with a first class cabin, Cathay Pacific's principal and commercial customer, Paul Loo, said: "We have a first class cabin on our B777, and the first class is a very specialized market. The right configuration to meet the needs of the market, the first class consumes a bit of real estate on the plane, so we have to make the compensation between having the cabin and having the additional costs instead of having the demand or not. "We believe that our first class B777 fleet is serving our market very well and, on the other hand, our A350 fleet, either the -900 or the -1000, the configuration will also help us develop markets that may not be available. for us today. " However, Loo did confirm that the airline is testing different prototypes for its next premium seat product for its upcoming Boeing 777-9X aircraft. The delivery increases the total size of the Cathay Pacific fleet to 207 aircraft. 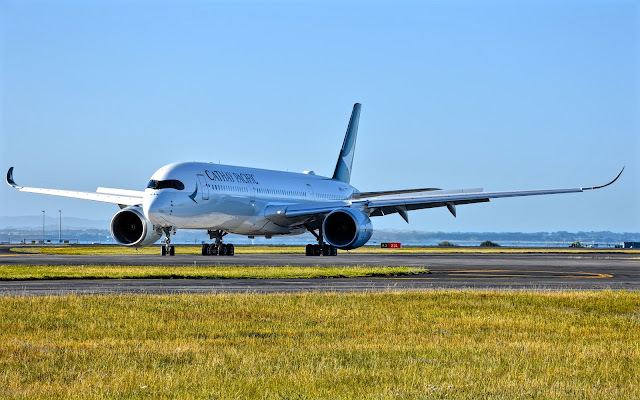 The airline has a total of 20 A350-1000 in the pipeline that are expected to be delivered by 2021, along with another six A350-900, 21 Boeing 777-9X next generation, as well as 32 A321neo aircraft that will go to its subsidiary regional, Cathay Dragon. The A350-1000 will fly to Taipei starting July 1 for familiarity with the crew, before its permanent deployment at the next Cathay Pacific service to Washington DC on September 15. The Dulles International Airport flight will be the longest in the airline network 7,085 nautical miles (8,153 miles / 13,122 kilometers) and will take approximately 17 hours. After Washington DC, Cathay Pacific will fly the plane to Madrid (as of October 28), followed by Tel Aviv, Amsterdam, Manchester and Zurich.